One of these can be found in the orchard at Ightham Mote in Kent. I don't find this variety produces pink flesh apples at all reliably. Only had some slight pinkness one year. Other apples not noted for pinkness produce more pinkness more often. 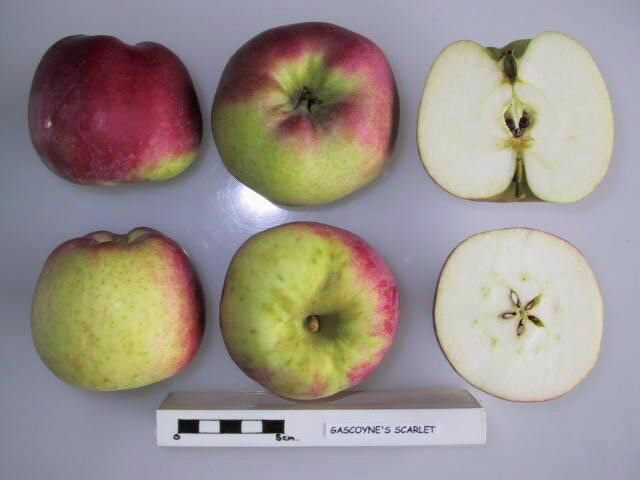 I am pleased to find some information about the Gascoyne Scarlet apple. We lived in Sheringham, Norfolk from 1970 to 2000 and we had a Gascoyne Scarlet apple tree in the garden. The fruit was lovely and could be either eaten raw or cooked. It kept well until about Christmas. Unfortunately it no longer exists as there is now a garage on the site. We have recently moved back to Norfolk and I look forward to finding another Gascoyne Scarlet tree to plant in our new garden. It is a pity it is not more widely known. An old friend who has lived in this part of London for thirty years, at the same address had this tree in the garden when he and his family moved in. The tree was old when they moved in and he wanted to 'clean up' the tree but wanted to know what it was. His house is 1930s era and there are speculations it might have been part of an old farm orchard on the slope it occupies or may have been planted in the 1930s. Whatever its origins it is both good as an eater, being large, sweet and colourful but also good for apple sauce as proved last weekend at dinner. Not a variety that is seen but certainly one that could well catch on again if given more prominence. A delightful eat! My grandfather used to grow this amongst many other old English apples in Essex. I remember it being a largish apple that could be used for both cooking and eating. It looked and tasted beautiful. On moving to this village 20 years ago I brought grafting material with me.I grafted Gascoyne-Gascoigne?? scarlet to make several cordons. They proved to appear to be Tip bearers so could not summer prune to form spurs What did I do wrong? Harry Burton from Applelucious orchard on Salt Spring Island sells these trees. By now i'm sure you've found one, but I thought I'd post in case you are still looking. I've grown Gascoyne's Scarlet as a cordon for nearly 20 years in Kent UK. It has cropped virtually every year. It's an excellent all rounder, you can eat it and cook it and it keeps until January/February, plus it's a beautiful looking apple. It was raised by Mr Gascoyne at Bapchild Court Sittingbourne Kent and introduced by the Maidstone fruit growers Bunyard & Co (information from Edward Bunyard's Handbook of Hardy Fruits ). Have you tasted this variety? Do you agree or disagree with our tasting notes? Tell us what you think! Record your blossom dates in our Fruit Tree Register - more >>. 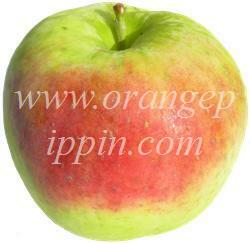 No orchards have registered as growing this variety. If you grow this and want to register please go to our Orchard Registration form. ©2019 Orange Pippin Ltd. All rights reserved. You may not reproduce any of the content of this website without our express permission. We do not accept any liability for loss or damage incurred as a result of any errors in the content of this website.